Hi! Me again. This time I'm jumping on here to talk about Nebula. I love talking about yarn in terms of fiber, twist & ply, and what type of project is suitable in each yarn. That is how I look at every yarn that passes through my studio and fingers. There is the visual aspect, which is what makes you reach out to grab, touch, feel, consume, a yarn. The visual is a result of the intrinsic loveliness of the fibers, and sometimes it is the result of the color, sometimes it is the result of the twist and ply, and sometimes, it is the result of some other specialness. Let us talk specialness of fiber. The specialness in this case is stellina, a flat, shiny, metallic looking nylon filament fiber. Stellina is clear or nearly clear, and very flat. As it twists and turns, the light shines off it, adding a subtle sparkle. Think paper flat and thinner than you can imagine, but soft. This filament adds a visual element to the yarn, while also adding some of the properties of nylon. Nebula is 84% super wash merino, 3-ply. Each ply appears to have a filament of stellina spun in, but the filament is cut into long staple lengths to work with the merino. Stellina brings specialness. Before we get off the specialness aspect of this yarn, let’s take a look at what Nebulas are. In one description I found they are called the nursery of the Universe. A nebula is a giant cloud of dust and gas. Giant, as in light years across, nebulae are fuzzy in appearance—like a fluffy bit of wool in the sky, surrounded by sparkly sky things (planets and stars). Anzula's Nebula is made of super wash merino and stellina and is colorful and a bit shiny. But shiny in a subtle and elegant way. Get an idea of all the yarn loveliness by looking at a universe of colors! Nylon is so perfect for a sock yarn. I am not a sock knitter, so I have to find other ways to enjoy sock yarns. Shawls, tops, scarves, and wraps are all perfect projects for sock yarn—especially sock yarn with a sparkle! So think outside your sock box and explore what else you can do with sock yarn. 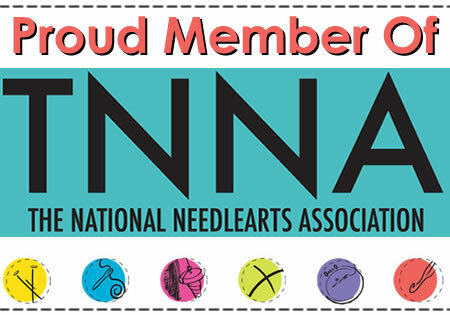 Go to Ravelry and see the nearly 1100 projects done in Nebula if you need ideas! I have done my usual observational swatch. I used US size 3(3.25mm) Addi lace needles. You could knit it on a smaller needle, but I don’t want this to be like a sock. I think you could go up to a US size 6(4mm) or 7(4.5mm) needle for lace. Always check your gauge. I am a loose knitter, so you may need to go up a size or two to get the same result. I currently have two projects I’m doing samples of in this yarn. One is Ashland, which can be knit as either a small collar or a larger shawlette. I love to knit this pattern, but these samples were knit by a knitter with a slightly firmer touch on the collar, and looser with more stitches it is a little lighter, in the larger piece. 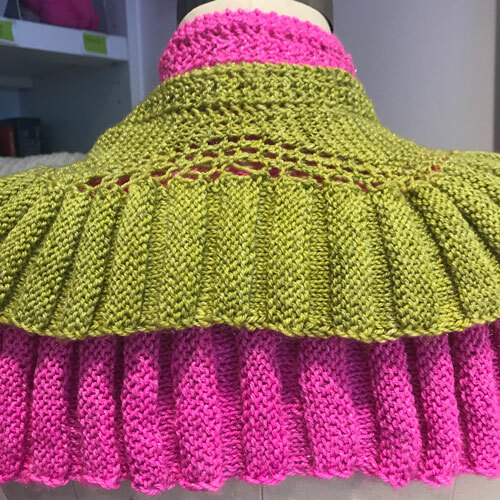 I love the colors together [Hyacinth and Avocado], and I am not sure I will ever wear them except layered that way. Finding the right buttons could be a challenge! The other project is in process and I don’t have photos of the sample yet. It is a lace sleeveless top called Silver Valley. I do have swatches, at two different gauges. Both fabrics are lovely, but I wanted a particular fabric. This stitch pattern is a 12-stich pattern using decreases and eyelets called Razor stitch. The pattern also uses a 6-stitch Razor for the yoke. I think it showcases the yarn perfectly. This color is sweet, but i chose a bolder color, Riot, for the sample. Too much sweet doesn’t appeal to me. Have you seen My Swatch Challenge? You can join any time, but there is still time to get in at the beginning. Each month I post a blog on my website to coincide with this post, that gives you instructions for a stitch pattern that I’ve used to do my swatch. These are related to patterns in my pattern collection. The Swatch Challenge post discusses Belon in Milky Way (swatch drawing on August 15), and contains the stitch pattern for the Oyster Shell . The next Swatch Challenge post is for Latin Quarter in Breeze (swatch drawing on September 15), and has the stitch pattern Tilting Ladder. Next up is be the post for Silver Valley in Nebula (swatch drawing on October 15), with the stitch pattern the 12-stitch Razor. All these posts have a link to Action Charts.